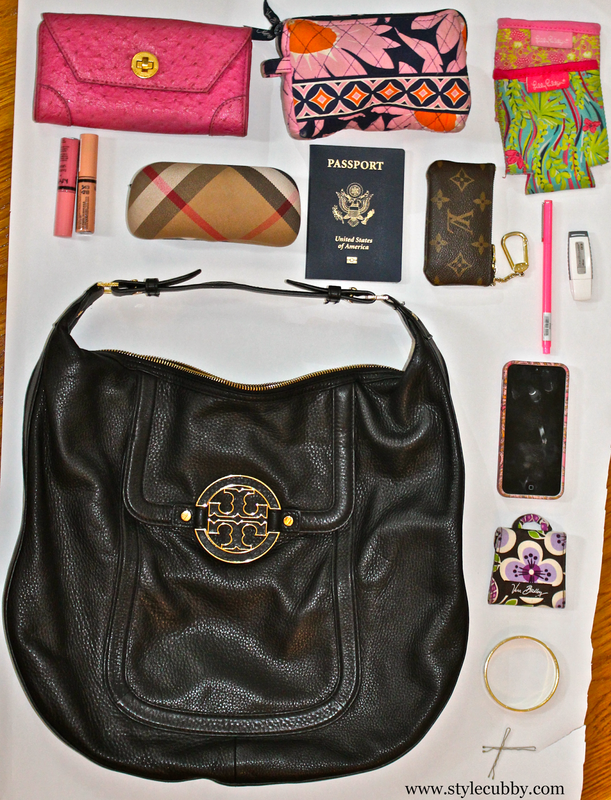 Maybe it's because I am so nosy or maybe it's the bag addict in me but one of my favorite posts and YouTube videos to watch is "What's In My Bag?". The other day, I was switching out my purse to a different one and decided to see what was inside! Tory Burch Hobo Bag (similar): I purchased this bag fall of 2012 and it is no longer available however, there are many similar styles that Tory Burch still offers! Marc by Marc Jacobs Wallet (similar): I keep my wallet with me in my bigger bags but rarely use it. I have a smaller wallet which keeps my most used cards and unless I have a big bag, I don't typically carry this wallet. Vera Bradley Small Cosmetic Case: In this bag I keep extra contacts, eye drops, medicine, lip gloss, chapstick, hair ties, women necessities and other miscellaneous things. This pattern is pretty old but they have some awesome new prints! Lilly Pulitzer Coozie: I always, always carry a coozie with me. I don't like the feeling of the sweat that comes off of cans, plastic or glass bottles. I keep one in every bag but somehow this bag collected two. My mom just gave me a new one for my birthday so the obsessions never ends! NYX Lipgloss: The color payoff and smell of these NYX lipgloss' make them perfection. They are one of my most favorite (and affordable!) lip products. Burberry Sunglasses: My eyes are very sensitive to the light so I try to remember to always keep a pair of sunglasses on me. Passport: I don't normally keep this on me but my license expired on my birthday and my new one was sent to my parents house. I was meeting my parents for dinner the night I took this picture and needed my passport for wine at dinner! Louis Vuitton Key Pouch: This pouch is the perfect size for cards. I keep my debit/credit cards, Charlie Card (for the T in Boston), license and other loyalty cards in this. It's easy to throw in a clutch, side bag, or even pocket of a jacket if I'm in a hurry. Le Pen: It's pink and a pen. USB: From printing pictures to transferring files between computers, I find I am always in need of a thumb drive. This is usually in the Vera Bradley Small Cosmetic Case but I must have forgotten to put it back. There is nothing special about mine but I LOVE this one. iPhone: Who isn't attached to their phone now a days? However, it's normally in my hand not in my bag. Vera Bradley Mirror: It's always nice to have a mirror with you for touch ups or if a contact is bothering your eye and you need to investigate what is going on. I received this one in a swag bag at an event I ran a few years ago, I couldn't find it online but I did find this awesome pouch that has one attached! Kate Spade BFF Bracelet: A special gift from friends that I wear almost every day. Bobby Pins: I lose this and find these everywhere. I like to get the blonde ones that match my hair. I always love reading these!! We definitely share some commonalities in our bags!! It's beautiful, when shopping today to see a Discount Marc Jacobs Clutchesin a shop,many girls like marc jacobs bags，very heart of it.